This could sound crazy, but to me, one of the biggest changes I felt when we moved to the U.S. was the difference in the kind of food you can find here. I mean, I love buying groceries here in the mid-west, because you can find a myriad of different ingredients and products (the result of the mixing of different nationalities of the people who live here) but if on one hand this is very stimulating (if you love cooking and eating as much as I do), on the other hand you soon realize that you miss some foods that were traditional in your country, and that are not possible to find in your new one. What I miss the most is the huge variety of fresh sea food, which you can find every day in Italy in the open air markets in the squares of the small town or in the sea food store. In the north-est part of Italy (where I come from), especially during the Christmas holidays, people stays in line for hours at the sea food market, to get the best (and more fresh) sea food, for the perfect Christmas Eve dinner. The most popular Christmas Eve dishes are lobsters (for the whealtier! ), scallops (which usually are baked with their shell, just with a little bit of olive oil, cognac and crumbled bread) and/or salmon crostini as appetizer; as main course-entree, seafood risotto (risotto ai frutti di mare) or smoked salmon tagliolini (which I’m writing about in my next post), and polenta e baccala’ alla Vicentina (which is a delicious way to cook codfish, with a particular kind of corn meal aside) as second course. OH MY, YOU CANNOT BELIEVE ME, BUT WHILE I’M WRITING ABOUT THIS MENU, MY MOUTH IS WATERING!!! This is why, I didn’t give up, and I tried to make a seafood risotto, with a frozen sea food mix that I found here… and you know what? We loved it! So here I am, sharing my recipe with you, and of course, if you live close to the coast, you can follow the recipe with fresh sea food to have a most tasteful risotto (And don’t forget to follow the 10 golden rules for a perfect risotto!). FEW HOURS BEFORE MAKING THE RISOTTO: Thaw the sea food, separate the Calamari and the Scallops from the Mussels and Shrimp (because the two have different cooking time), and then dry them very well (using some paper towels). I also took the mussels out of their shell, but saved few shells to decorate the risotto at the end. 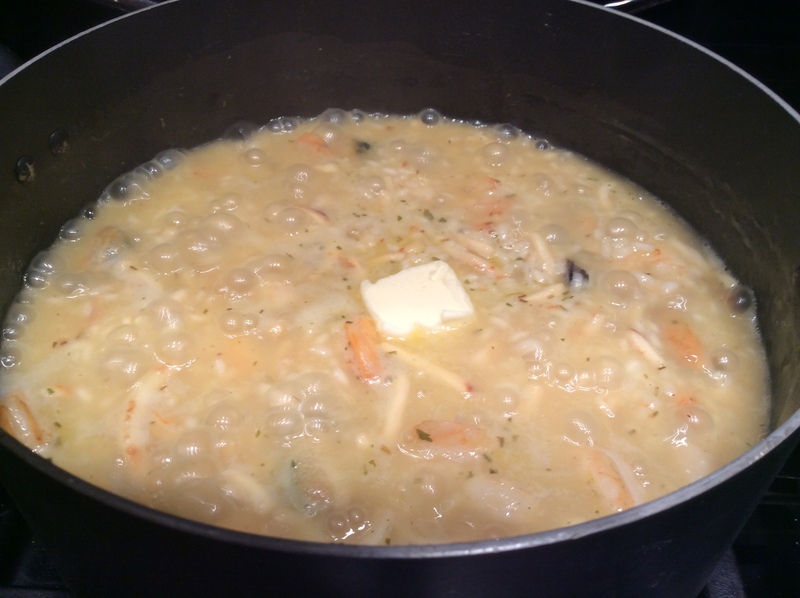 AT ANY TIME DURING THE DAY YOU WANT TO PREPARE THE SEAFOOD RISOTTO’S BASE. In a big pan pour some olive oil and the garlic gloves and heat it. When the oil looks hot, add the calamari and a pinch of crushed red pepper (depending on how spicy you like it) and let it cook for about 15 minutes or until all the water evaporates. If it becomes too dried out, add some white wine. 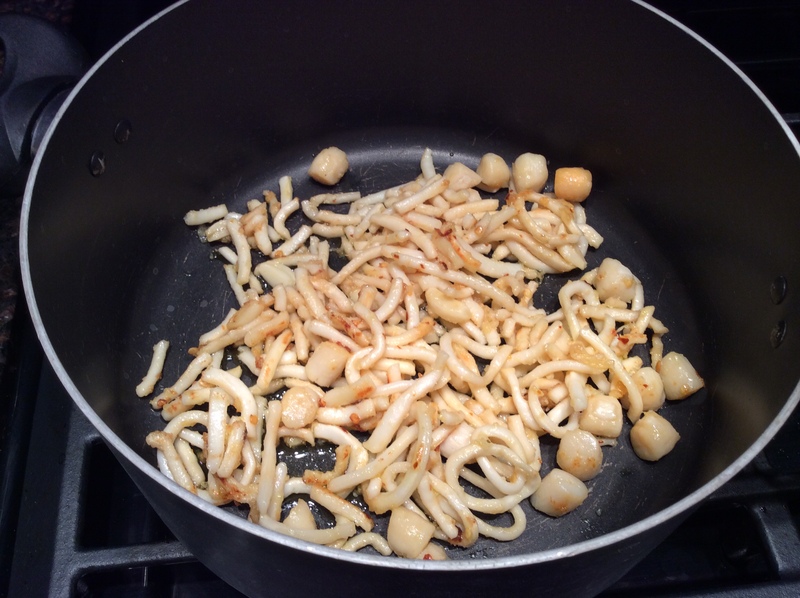 Then add the scallops, and let them cooked with the calamari until they all become golden. Next, put the mix in a big pot (the one in which you’ll make your risotto) taking care to remove the garlic cloves. Without rinsing the pan, add a little bit of olive oil and when it is hot, add the shrimp and mussels, spread some dried rosemary, keeping at medium heat. Just brown them on both sides (it should take not more than 5 minutes, but anyway, wait until all their water evaporate). Then add this mix to the pot. 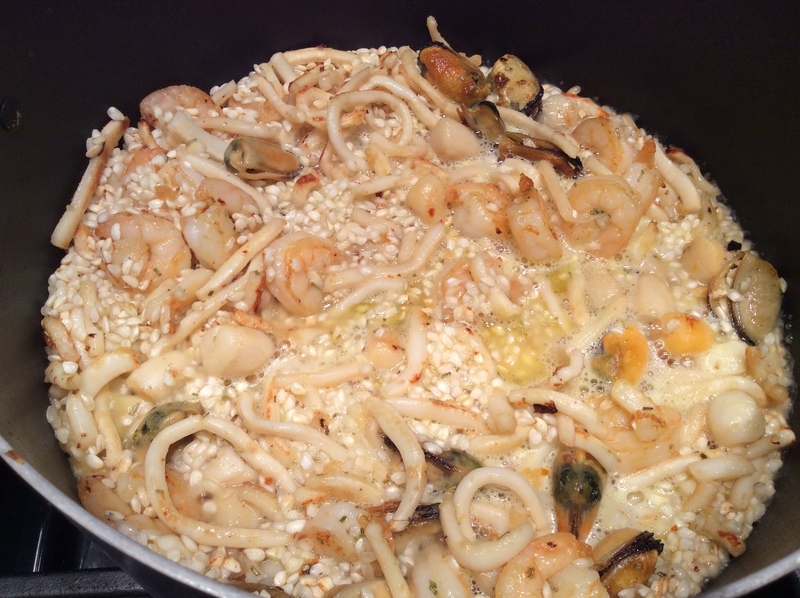 At high heat, reheat the seafood in the big pot. And when it is very well heated, add the rice, stir the mix, and let the rice roast few minutes -without burning it! Next put the pot on medium heat, add 3 oz. of white wine and a pinch of sea salt, and stir. Turn on the timer for a 20 minutes. As soon as all the wine is evaporated, add some of the broth and stir. Be careful not to add too much, and at the same time, enough to keep the rice from burning onto the bottom of the pan. Continue adding the broth, a little at a time, waiting each time until it is absorbed before adding more. During the 20 minutes of cooking you should have to use most of all the broth. When there are just three minutes left on the timer, add another ladle of broth and the butter. Stir, switch off the heat, and put the lid over the pot until the end of the 20 minutes (in Italy we call this specific phase “mantecatura”). Your risotto is ready! Before serving, you can add the shells as decoration, and you can suggest your guests sprinkle some black pepper on the top of it, if they like. < SPAGHETTI ALL’AMATRICIANA: how to get the best from bacon!